"This dressing has a mild raspberry flavor. I usually prepare it with canola oil." My grocery store doesn't carry raspberry vinegar so I used a combination of red wine vinegar, white vinegar, & pureed raspberries. Also added about 1 Tablespoon of poppyseeds. Delicious!! Excellant! I omitted the sugar and replaced it with seedless raspberry jelly. fabulous! fruit vinaigrettes are a nice alternative. I half the amount of sugar, however. 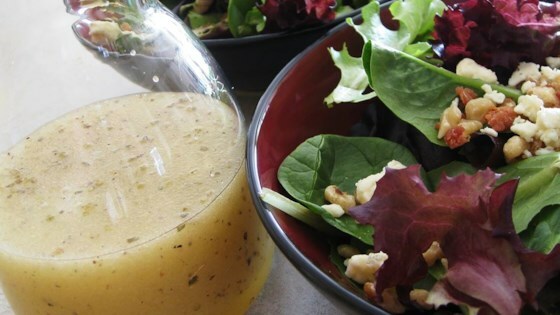 This dressing goes nicely on my favourite salad - lettuce, manderine oranges and roasted almonds. I used rasberry balsamic vinegar as did a few others who have rated this recipe and about half the sugar. Sweet and tangy! Definately a keeper.